There are several benefits in allowing DFW Finishers to work on your next deck staining, fence staining, or wood staining project. Our staining process will protect and preserve the wood of your home; it will keep the value of your investment up; it will add a high level of beauty and aesthetic appeal to your home (our custom restoration process will give curb-appeal to your home); and it will bring you pleasure and personal satisfaction. The deck, fence, and wood specialists at DFW Finishers will create a great place for you to enjoy. Over time, your wood surfaces become weathered and may even be damaged. Our restoration process will bring the wood of your home back into a “like new” condition, and our high quality stain will protect your wood from further damage. A thorough preparation of the surfaces is essential to a lasting and quality job. Our deep cleaning will produce a surface that our high quality stains and sealers can soak into. We will remove molds, mildews, dirt, and grime revealing the natural beauty of your wood. We use cleaners and strippers to get the surface ready and remove any old stain and previous coatings when needed. We follow up the cleaning and stripping with a brightening agent which returns your wood to a “like new again” look, and prepares the wood for maximum stain adherence and penetration. We offer both natural transparent and solid body stain finishes. DFW Finishers offers a complete service so we can take care of any rotten wood or repairs that need to be done prior to the cleaning and staining process. 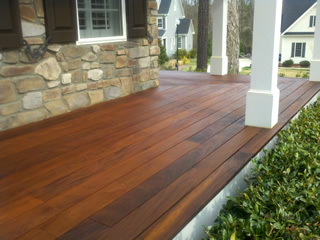 The best thing you can do once your deck, fence or wood is professionally restored by DFW Finishers is to maintain it. Continued maintenance on your structure will differ according to the exposure it has to the sun and elements. Most decks will require maintenance every two years to maintain its beauty and protection; most hardwoods will require more periodic maintenance due to the density of the wood. DFW Finishers can be your maintenance specialist – we will do a thorough cleaning of the surfaces, and then apply a fresh coat of stain. It’s a lot easier to maintain your deck, fence or other wood structure once it’s been done right; it can also be done at a fraction of the initial cost. DFW Finishers of Holly Springs, North Carolina are: Experts at deck staining and fence staining including deck cleaning, fence cleaning, wood care, and wood restoration; and Professionals at deck restoration and refinishing in the Raleigh, NC area. We service the areas of Holly Springs, Raleigh, Apex, Cary, Morrisville, Fuquay-Varina, Garner, and Durham, NC. We also serve the Greater Research Triangle area.